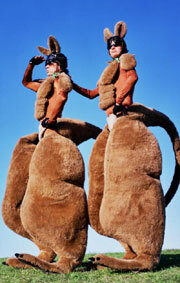 Hilarious 8 foot walk-about (or bounce-about) roaming characters and street performers. Fabulous for festivals, Australian or outback bush themed events, product launches, shopping centres, outdoor or corporate functions and events.2-8 performers. 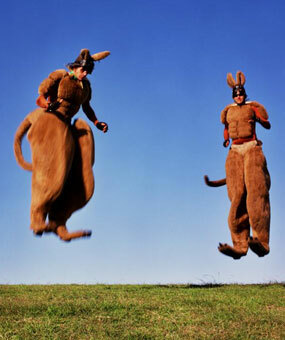 These Bouncy Kangaroos are a fabulous walk-about act : giant kangaroos on amazing bouncing stilts. Jumping up to a metre off the ground and 2 metres across in a bound, they are a phenomenal sight. Their characters are a crossover of outback macho and inner city punk savvy — always cheeky but never offensive. A favourite at festivals around the world. These 8ft kangaroos are an unforgettable sight whether bouncing down the high street or through the crowds of a festival. 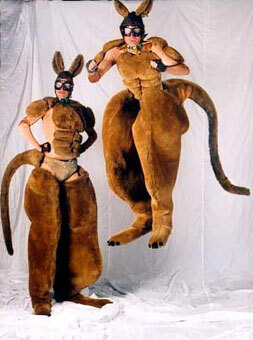 A parody of Australian machisimo, they have big personalities to match.